As you may have seen from my past performance related articles and HashMap case studies, Java thread safety problems can bring down your Java EE application and the Java EE container fairly easily. One of most common problems I have observed when troubleshooting Java EE performance problems is infinite looping triggered from the non-thread safe HashMap get() and put() operations. This problem is known since several years but recent production problems have forced me to revisit this issue one more time. This article will revisit this classic thread safety problem and demonstrate, using a simple Java program, the risk associated with a wrong usage of the plain old java.util.HashMap data structure involved in a concurrent threads context. For more detail on the ConcurrentHashMap implementation strategy, I highly recommend the great article from Brian Goetz on this subject. * Results and performance of the Java program may vary depending of your workstation or server specifications. Each of these worker threads has the same task: lookup and insert a new element in the assigned Map data structure using a random Integer element between 1 – 1 000 000. Now find below the source code of our sample program. Find below the graphical results of the execution of the Java program for each iteration along with a sample of the program console output. As you can see, the ConcurrentHashMap is the clear winner here, taking in average only half a second (after an initial ramp-up) for all 3 worker threads to concurrently read and insert data within a 500K looping statement against the assigned shared Map. Please note that no problem was found with the program execution e.g. no hang situation. The performance boost is definitely due to the improved ConcurrentHashMap performance such as the non-blocking get() operation. 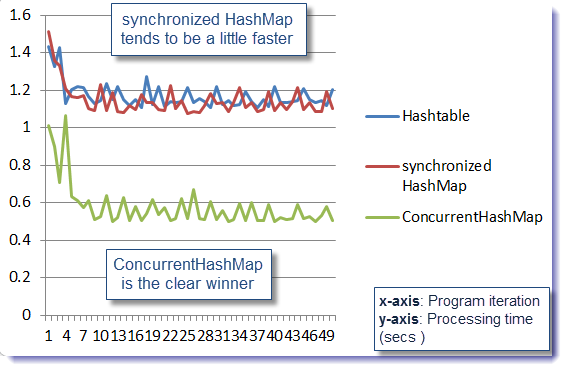 The 2 other Map implementations performance level was fairly similar with a small advantage for the synchronized HashMap. What happened? In order to understand this situation and confirm the problem, we will perform a CPU per Thread analysis from the Windows OS using Process Explorer and JVM Thread Dump. 1 - Run the program again then quickly capture the thread per CPU data from Process Explorer as per below. Under explore.exe you will need to right click over the javaw.exe and select properties. The threads tab will be displayed. We can see overall 4 threads using almost all the CPU of our system. 2 – Now you have to quickly capture a JVM Thread Dump using the JDK 1.7 jstack utility. For our example, we can see our 3 worker threads which seems busy/stuck performing get() and put() operations. As you can see, the above correlation and analysis is quite revealing. 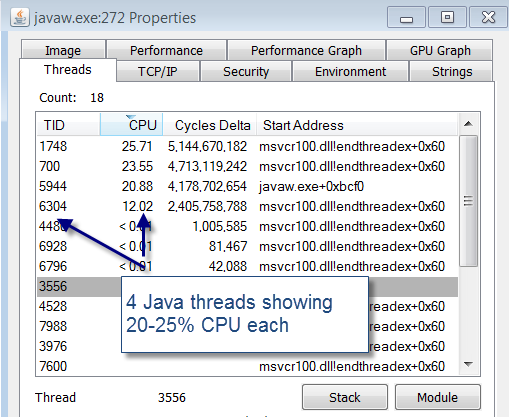 Our main Java program is in a hang state because our 3 worker threads are using lot of CPU and not going anywhere. They may appear "stuck" performing HashMap get() & put() but in fact they are all involved in an infinite loop condition. This is exactly what we wanted to replicate. Now let’s push the analysis one step further to better understand this looping condition. For this purpose, we added tracing code within the JDK 1.7 HashMap Java class itself in order to understand what is happening. Similar logging was added for the put() operation and also a trace indicating that the internal & automatic rehash/resize got triggered. The tracing added in get() and put() operations allows us to determine if the for() loop is dealing with circular dependency which would explain the infinite looping condition. Again, the added logging was quite revealing. We can see that following a few internal HashMap.resize() the internal structure became affected, creating circular dependency conditions and triggering this infinite looping condition (#iterations increasing and increasing...) with no exit condition. It is also showing that the resize() / rehash operation is the most at risk of internal corruption, especially when using the default HashMap size of 16. This means that the initial size of the HashMap appears to be a big factor in the risk & problem replication. The HashMap was our top performer but only when preventing an internal resize. Again, this is definitely not a solution to the thread safe risk but just a way to demonstrate that the resize operation is the most at risk given the entire manipulation of the HashMap performed at that time. The ConcurrentHashMap, by far, is our overall winner by providing both fast performance and thread safety against that test case. We will now conclude this article by looking at the different Map implementations within a modern Java EE container implementation such as JBoss AS 7.1.2. You can obtain the latest source code from the github master branch. Hashtable references were found mainly within the test suite components and from naming and JNDI related implementations. This low usage is not a surprise here. References to the java.util.HashMap were found from 512 Java classes. Again not a surprise given how common this implementation is since the last several years. However, it is important to mention that a good ratio was found either from local variables (not shared across threads), synchronized HashMap or manual synchronization safeguard so “technically” thread safe and not exposed to the above infinite looping condition (pending/hidden bugs is still a reality given the complexity with Java concurrency programming…this case study involving Oracle Service Bus 11g is a perfect example). A low usage of synchronized HashMap was found with only 18 Java classes from packages such as JMS, EJB3, RMI and clustering. Finally, find below a breakdown of the ConcurrentHashMap usage which was our main interest here. As you will see below, this Map implementation is used by critical JBoss components layers such as the Web container, EJB3 implementation etc. Not surprising here since lot of internal Map data structures are used to manage the http sessions objects, deployment registry, clustering & replication, statistics etc. with heavy concurrent Thread access. Used by highly concurrent structures such as internal JNDI security management. Used by high concurrent Threads Map data structures involved in handling and dispatching/processing incoming requests such as HTTP. Used in the context of ClassLoader and concurrent static Map data structures involving concurrent Threads access. Used in some integration testing test cases such as an internal Data Store, ClassLoader testing etc. I hope this article has helped you revisit this classic problem and understand one of the common problems and risks associated with a wrong usage of the non-thread safe HashMap implementation. My main recommendation to you is to be careful when using an HashMap in a concurrent threads context. 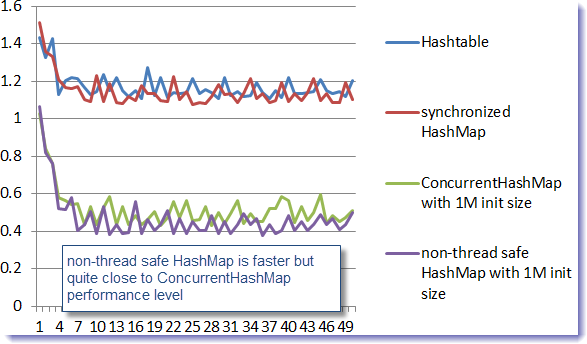 Unless you are a Java concurrency expert, I recommend that you use ConcurrentHashMap instead which offers a very good balance between performance and thread safety. As usual, extra due diligence is always recommended such as performing cycles of load & performance testing. This will allow you to detect thread safety and / or performance problems before you promote the solution to your client production environment. Please provide any comments and share your experience with ConcurrentHashMap or HashMap implementations and troubleshooting.